Lee Brown Coye met Lamont Buchanan in 1944, probably in late spring or early summer, after Coye had received an assignment to illustrate Sleep No More, an anthology of fantasy and horror stories edited by August Derleth. 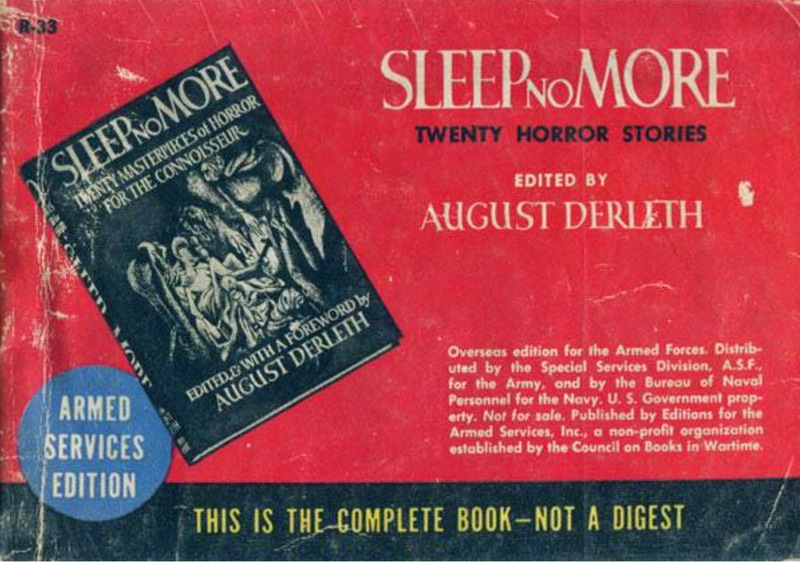 Unlike so many books edited by Derleth and published after 1939, Sleep No More was issued not by Derleth's own Arkham House but by the New York firm of Farrar and Rinehart. In the summer of 1944, when Farrar and Rinehart was preparing Sleep No More for publication, Coye was unknown to Derleth. He had been selected instead by Farrar and Rinehart editor Philip Wylie, a former writer of pulp fiction, or by one of Wylie's associates, art editor Faith Ball or managing editor Adelaide Sherer. In any case, Sleep No More was to be Lee Brown Coye's first widely distributed illustrative work in the field of fantasy and the macabre, and he took full advantage of the opportunity. 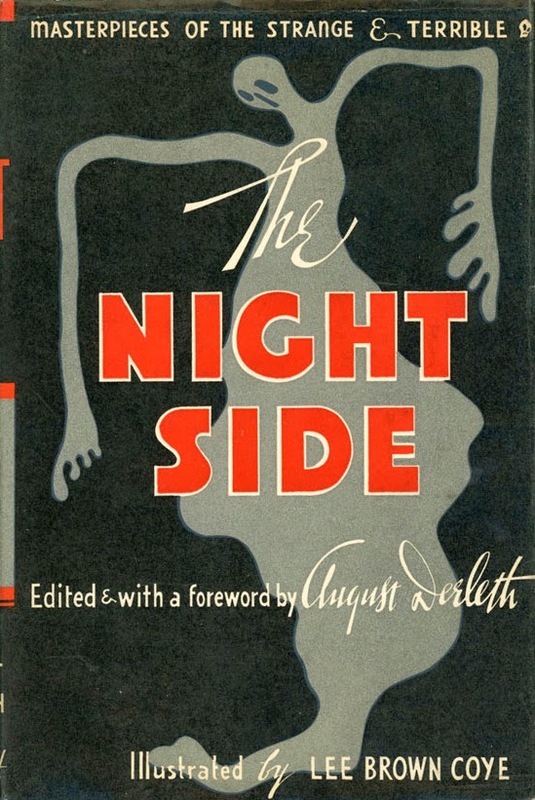 Given only a month to complete his work, Coye dashed off twenty-five interior illustrations and the design for the dust jacket, including typography. Added to the difficulty of a short deadline was the fact that the book was already at the printer and unavailable for Coye's review. If he was going to read the stories included in the book, he would have to go to the source--to the New York offices of Weird Tales magazine. (1) There, Lamont Buchanan, who doubled as associate editor and art editor, noticed Coye at work, studying back issues and making sketches. Buchanan started a conversation; Coye left that day with his first assignment for Weird Tales. Other artists--Virgil Finlay, Margaret Brundage, Hannes Bok--had created wondrous and fantastic art for Weird Tales, but few could match the weird, macabre, outré work produced by Lee Brown Coye over the next seven years. In the meantime, Sleep No More: Twenty Masterpieces of Horror for the Connoisseur was published on September 21, 1944, as the length of night overtook that of the day. The book was a success, selling out its initial print run of 6,000 copies. 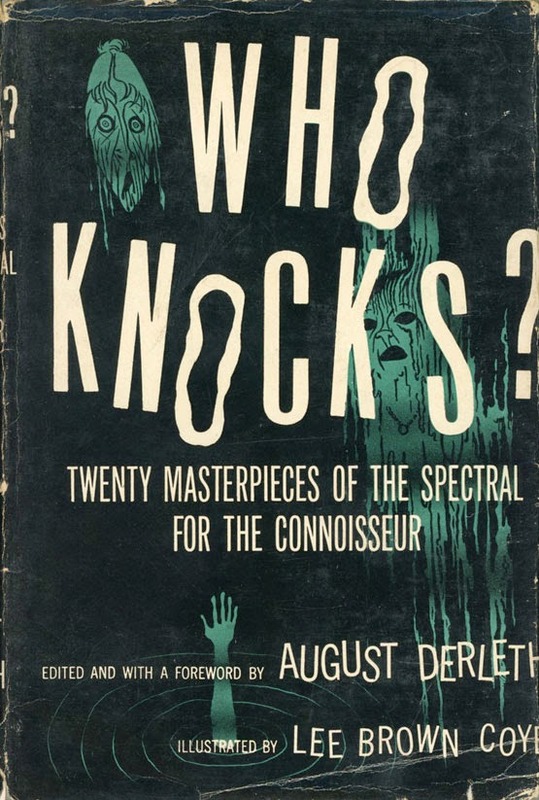 A printing of 2,500 copies soon followed, as did two more volumes in the series, Who Knocks? Twenty Masterpieces of the Spectral for the Connoisseur (1946) and Night Side: Masterpieces of the Strange & Terrible (1947). Both were edited by August Derleth, published by Farrar and Rinehart, and illustrated by Lee Brown Coye. Coye kept busy with his fine art, commercial art, and illustration throughout the 1950s. 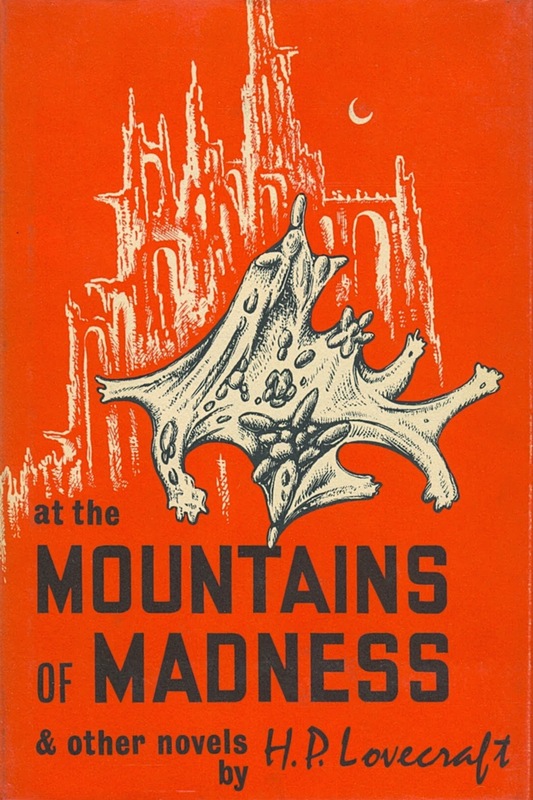 Beginning in the early 1960s, he created illustrations for Derleth's own Arkham House. First came Who Fears the Devil by Manly Wade Wellman and The Dunwich Horror and Others by H.P. Lovecraft, both in 1963. Over the next seven years, Coye illustrated eight more books for Arkham House, including volumes by Lovecraft, Arthur J. Burks, E. Hoffman Price, and Clark Ashton Smith. Derleth was to have written a story based on Lee Brown Coye's experiences along Mann Brook in 1938. Death, however, intervened, claiming August Derleth on July 4, 1971. If Coye's story was going to be fictionalized, another writer would have to do it. (1) Seven--perhaps eight--of the twenty stories in Sleep No More first appeared in Weird Tales. 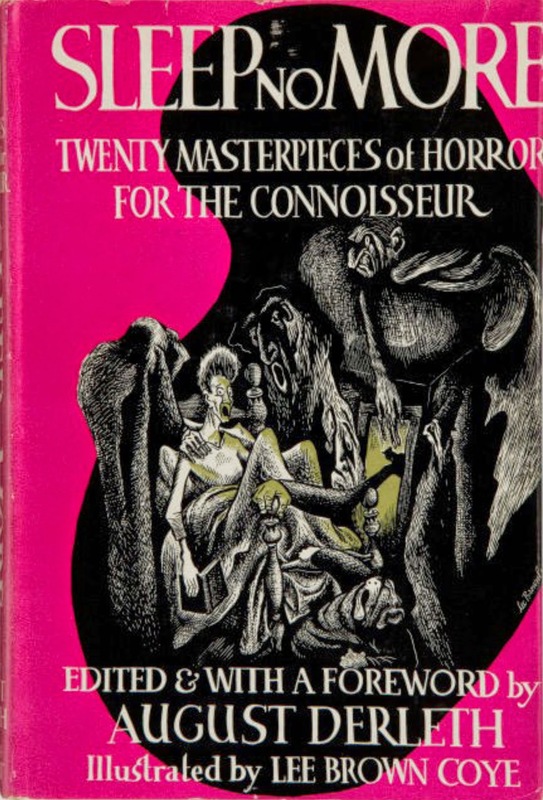 A gallery of book jacket illustrations by Lee Brown Coye (and one by Frank Utpatel), beginning with Sleep No More: Twenty Masterpieces of Horror for the Connoisseur (1944) . . .
and the Armed Services Edition of the same book. Who Knocks? Twenty Masterpieces of the Spectral for the Connoisseur (1946). The Night Side: Masterpieces of the Strange & Terrible (1947). 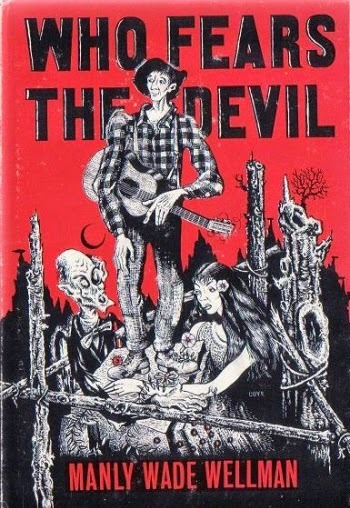 Who Fears the Devil by Manly Wade Wellman (1963), Coye's first job for Arkham House. 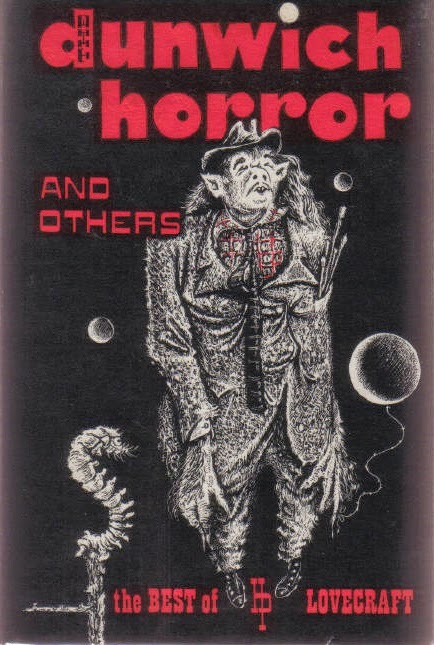 The Dunwich Horror and Others by H.P. Lovecraft (1963). 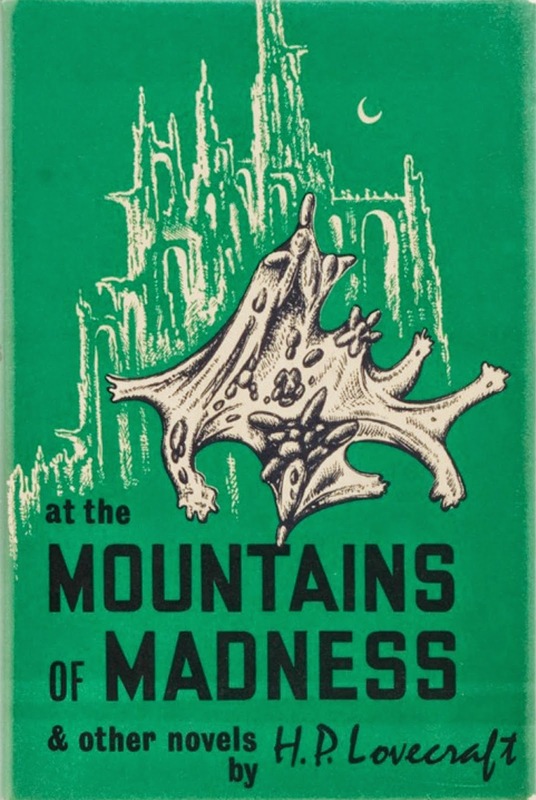 At the Mountains of Madness by H. P. Lovecraft (1964), in green and orange. 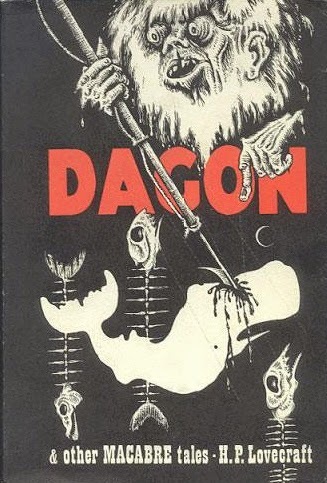 Dagon & Other Macabre Tales by H.P. Lovecraft (1965). 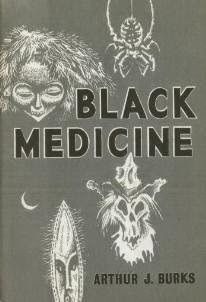 Black Medicine by Arthur J. Burks (1966). The Dark Brotherhood and Other Pieces by H.P. 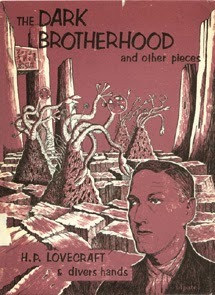 Lovecraft and Divers Hands (1966), with cover art by Frank Utpatel. Coye did interior illustrations for this volume. 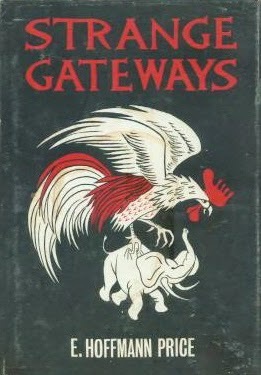 Strange Gateways by E. Hoffman Price (1967). 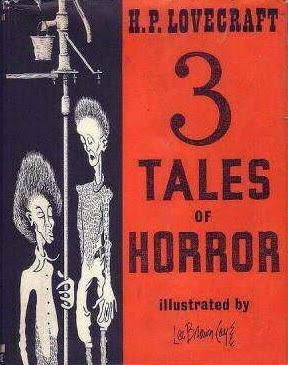 3 Tales of Horror by H.P. Lovecraft (1967). Tales of the Cthulhu Mythos by H.P. Lovecraft and Others (1969). Other Dimensions by Clark Ashton Smith (1970). Sticks. "Sticks," a short story by Karl Edward Wagner, was first printed in Whispers #3, dated March 1974. "Sticks" won for its author the British Fantasy Award for Best Short Story in 1975 and was nominated for the World Fantasy Award Best Short Fiction that same year. Since its original publication, Wagner's story has been reprinted more than three dozen times and has been adapted to radio. There can be little doubt that "Sticks" was also the inspiration for The Blair Witch Project, a very popular, much loved, and much hated film from 1999. Wagner himself was inspired by an experience in the life of Lee Brown Coye and wrote his story in tribute to the artist. Thereby hangs a long tale. The lineage of "Sticks" and The Blair Witch Project can be traced to 1938 and a trout-fishing trip Lee Brown Coye made to the Otselic River valley in his native New York State. By then he was a dozen years into his career as a commercial artist, fine artist, and illustrator. He and his wife, Ruth, lived in Syracuse, a mid-sized city and the seat of Onondaga County. Madison County borders Onondaga County to the east. South of that is Chenango County, where Coye's grandfather had a farm and where Coye himself often went fishing. In the previous year, Coye had illustrated a promotional booklet called Bait, issued by Flack Advertising of Syracuse. As soon as the winter of 1937-1938 ended, Coye was out casting his line into the waters of his native region. In that quarter century, Lee Brown Coye made a name for himself in the small circles of fantasy and the macabre for his own strange and fantastic art, a showcase for which was the magazine Weird Tales. From 1945 to 1951, Coye created ten cover illustrations for the magazine, then under the associate editorship of his friend, Lamont Buchanan. He also drew scores of interior illustrations, including a regular series called "Weirdisms," which ran from July 1947 to July 1951. Coye's illustrations for Weird Tales and for a series of hardbound anthologies of the 1940s would one day lead him to Karl Edward Wagner and to the protagonist's role in "Sticks." That was still decades away. (1) Quoted in Arts Unknown: The Life and Art of Lee Brown Coye by Luis Ortiz (2005), p. 7. 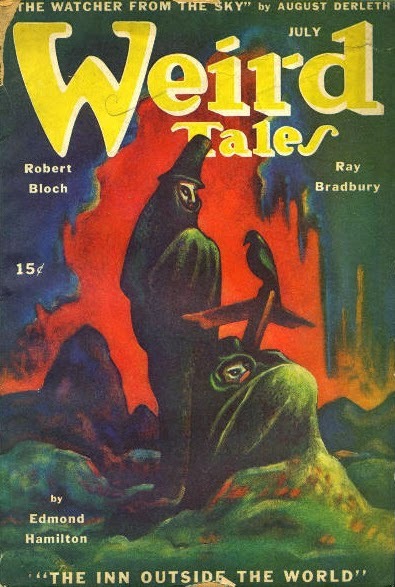 Weird Tales, July 1945, Lee Brown Coye's first cover for the magazine. This is a color version of Coye's interior illustration for "Count Magnus" by M.R. James from the hardbound anthology Sleep No More (1944). Curiously, the story itself does not appear in the magazine. 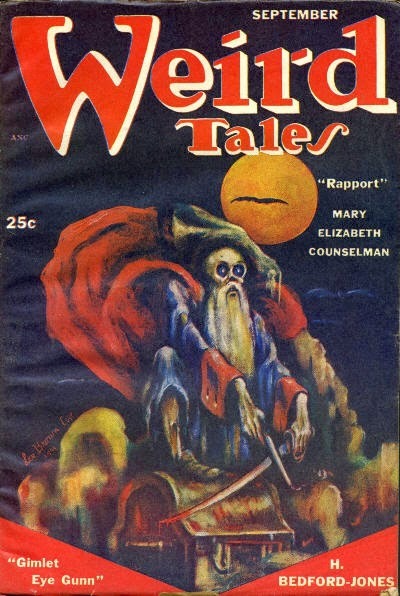 In fact, Weird Tales did not publish or reprint any stories by M.R. James (1862-1936), despite his prolificacy as a writer of ghost stories. I would like to have posted an image of the original illustration here, but I am unable to find one on the Internet. Weird Tales, November 1945, a somewhat conventional illustration by Coye. Weird Tales, March 1946. Not just omens, but ominous omens. Not just evil, but double-evil. Despite the silly blurb, I find this cover to be very powerful, perhaps Coye's best for Weird Tales, and like a vision from a dream. It seems to me that Lee Brown Coye was a true artist, a man who lived in his imagination, or whose imagination spilled out into the real world. 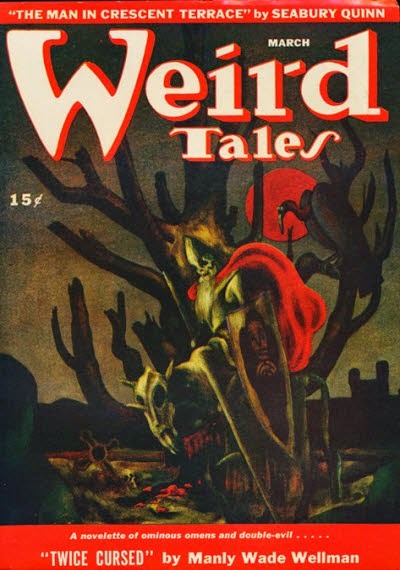 His cover for this issue of Weird Tales, though surreal, has a strange reality to it, as if it were painted from life, or perhaps life-in-a-dream. I suppose that was the aim of the surrealists, although I'm not sure Coye would have associated himself with surrealism or called himself a surrealist. Weird Tales, July 1947. Too often, vampires are glamorized or sexualized in popular culture. Coye's portrayal is closer to what must be the truth about vampires: that they are revolting creatures of decay and that their moral depravity must be expressed in their bodily ugliness. 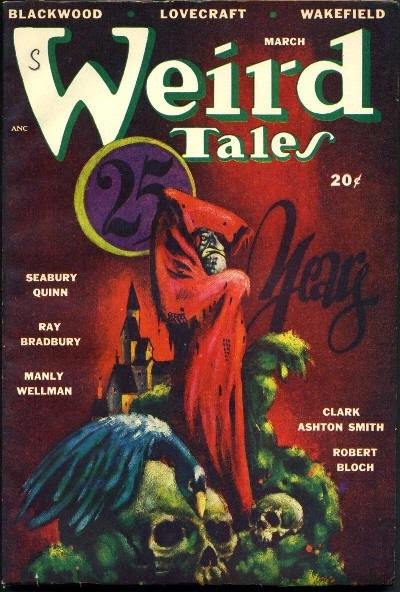 Weird Tales, March 1948, the twenty-fifth anniversary issue of a magazine that barely made it past infancy. 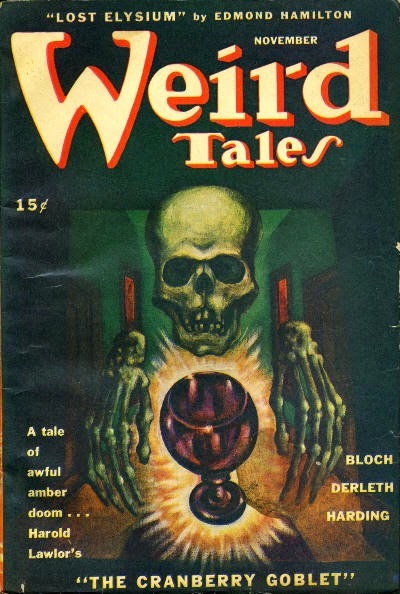 This must have been a plumb assignment for a Weird Tales artist. It is perhaps significant that Coye got the nod from art editor Lamont Buchanan. Weird Tales, September 1948. 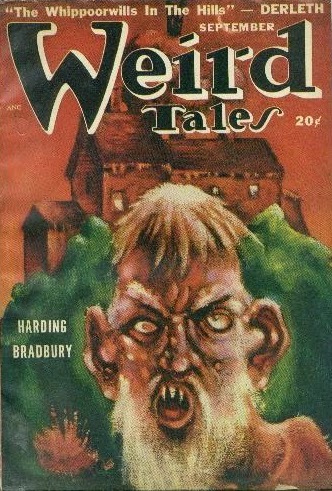 Note the decaying house in the background, the second of three in Coye's covers for Weird Tales. Luis Ortiz, Coye's biographer writes: "He was already [in 1938, at the time of his fishing trip along Mann Brook] preoccupied with the decaying stillness of buildings . . . ." (p. 48). Coye himself admitted, "I guess that's the morbid side of my personality. I see a lot of pathos in a building . . . . I can't paint happy pictures . . . Bright landscapes just aren't [me]." (Quoted on page 48). Weird Tales, January 1949. 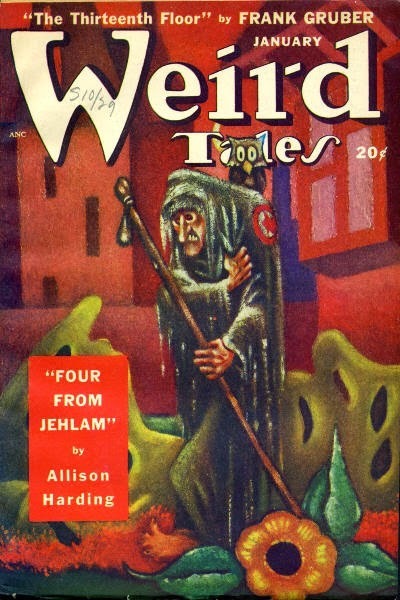 The cover story is "Four from Jehlam" by Allison V. Harding, a pseudonym attributed to Jean Milligan, the wife of Weird Tales associate editor and art editor Lamont Buchanan. Mr. Buchanan was also the man who recruited Lee Brown Coye to his magazine. Weird Tales, March 1950. The second of two cover stories by Manly Wade Wellman illustrated by Lee Brown Coye. Wellman's name will pop up later in this long tale. Weird Tales, May 1951. 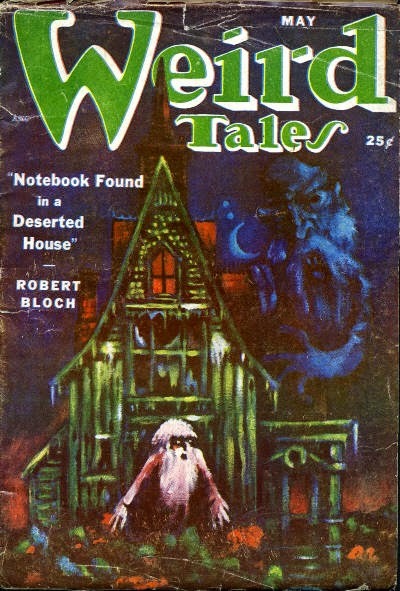 The cover story, "Notebook Found in a Deserted House" by Robert Bloch, is supposed to have been another inspiration for The Blair Witch Project. I'll read it and let you know what I think. Weird Tales, September 1951, Lee Brown Coye's last cover for "The Unique Magazine." Note his full name in the signature. The other day I wrote about Lee Brown Coye and witches together. Now, I'll write about them separately. First the artist. Lee Brown Coye was born on July 24, 1907, in Syracuse, New York, but as a child moved with his family to the nearby small town of Tully. Fittingly, for a later artist of fantasy and the macabre, Coye grew up in a house built in the Gothic style with a tall Gothic window under its front eaves. Like many artists of his generation, Coye copied pictures out of the comics as a boy. The Gumps and Toonerville Folks were two favorites. Coye graduated from Groton High School in Groton, New York, in 1926. His first job out of school was as a draftsman at the typewriter company where his father worked. Drawing pictures of typewriters was not for the young artist, however, and in 1928, Lee Brown Coye, with his new wife, the former Ruth Carmody, settled in Syracuse and began attending art classes at Syracuse University. His teacher there was George Hess. In 1929, Lee and Ruth Coye moved to Leonia, New Jersey, the location of a famed artist's colony that included Harvey Dunn and Dean Cornwell, two heirs to the Howard Pyle school of American illustration. There Coye took lessons from Howard McCormick (1875-1943), an accomplished illustrator and wood engraver. In attempting to get his work into the public eye, Coye rode a ferry every week or so from Fort Lee Landing to Manhattan where he made the rounds of art director's offices and art galleries, usually without success. When the stock market crashed in 1929, Lee and Ruth Coye, their savings nearly gone, retreated to Groton. By 1931, they were living in Syracuse, where Coye landed a job as a commercial artist at an advertising agency. The following year he opened his own studio, Coye & Kaplan, with a friend, Leo Kaplan. The two produced Coye's first extended work of illustration, a limited-edition book called The Seventh Ogre (1932). And very limited it was: only 350 copies were printed. In 1934, Coye began work on a series of murals for Cazenovia Central School under the auspices of the Public Works of Art Project (PWAP), an alphabet-soup agency of the Federal government. "I was a big shot," Coye claimed. His pay was $37.50 a week. The murals for Cazenovia occupied Coye for most of what was left of the 1930s. At the same time he worked at various commercial art jobs and illustrated a number of publications, including dust jackets or interior illustrations for The Vicar of Azay-Le-Rideau by Honore Balzac (1937), The Land Is Large by Emerson Waldman (1938), Scylla the Beautiful by Albert and Helen Fowler (1939), and Beat! Beat! Drums! A Poem of the Civil War by Walt Whitman (1939). In the spring of 1938, Lee Brown Coye was on a trout fishing trip near the town of DeRuyter, New York, when he had a strange experience that would one day help define his work. Deep in the woods and following an abandoned railroad grade, Coye came upon a thicket of pine trees and scrub. Once in the thicket, he began noticing "a strange pattern of stones lying on the ground," a maze-like pattern through which he passed to find something stranger still. Nailed and wired together were collections of sticks and boards "in fantastic array," stuck in piles of stone or in stone walls. Further on, Coye came to an abandoned and decrepit farmhouse and still more stick structures in the yard and trees around the house and even on its walls. Still he continued, descending a set of stone steps into the cellar of the house. Suddenly, from the darkness, a hand grabbed him. Using the only weapon he had--a small frying pan hanging from his belt--he struck at whatever held him and fled from the cellar and the house. Whether Coye's tale is true or not, he began using the stick-lattice motif in his work to such an extent that it became a kind of signature. His tale survives not only in his art but also in fictionalized form in a short story by Karl Edward Wagner. Appropriately enough, it is entitled "Sticks." 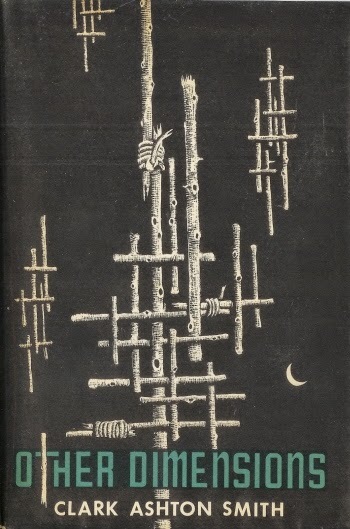 Other Dimensions by Clark Ashton Smith, published in 1970 by Arkham House with a stick-motif cover by Lee Brown Coye. I have been reading The Revolt of the Masses by José Ortega y Gasset. It's a somewhat difficult book, not because of its ideas--the author mostly stays away from dense philosophical musings--but because of its style. Ortega y Gasset (or maybe his translator) wrote in a somewhat thick, cumbersome, even archaic, way. Despite its Latin origins, there is little flourish here. In any case, this is a valuable book, especially for those interested in freedom and tyranny. Eric Hoffer must have read it keenly in formulating his own work, The True Believer: Thoughts on the Nature of Mass Movements (1951). The mass says to itself, "L'État, c'est moi," (1) which is a complete mistake . . . . But the mass-man does in fact believe that he is the State, and he will tend more and more to set its machinery working on whatsoever pretext, to crush beneath it any creative minority which disturbs it . . . . In other words, the State, first a lethal machine, then a vampire, will come to its end as one of the walking dead. The Revolt of the Masses was published in 1932, after Communists had seized power in Russia and Fascists in Italy, but before Hitler rose to be Führer of the German people. Statism was then powerful and on the rise. Nonetheless, Ortega y Gasset seems to have predicted the end of the Soviet Union in his description of a "bloodless" State, "dead with the rusty death of machinery." We can all be forgiven our lack of sympathy upon its demise. (1) A more recent statement of that belief: "Government is the only thing we all belong to," from the Democratic national convention of 2012. Ortega y Gasset called the United States a paradise of the mass-man. But here I think we can make a distinction between his mass-man and Hoffer's true believer. The true believer is a man of action. He is also very often a man of great physical courage, despite the loathsome beliefs that animate him. The idea that "Government is the only thing we all belong to," symbolized by a hot-chocolate-sipping pajama boy, is, on the other hand, a creed of inaction, passivity, cowardice, and failure. More to the point, it's just plain stupid. (2) From The Revolt of the Masses by José Ortega y Gasset (Norton, 1957), pp. 120-121. (3) There may be millions of people today saying, "Je suis Charlie," but only a dozen lost their lives standing for their freedom and ours. The rest of us can't really exalt ourselves too much, and we should be humble in any of our pronouncements. It's easy for the living to claim courage, especially when they're standing in a crowd of millions. The cartoonists at Charlie Hebdo stood alone. (4) In terms of genre fiction, they are not the subjects of fantasy, horror, or weird fiction, all of which are of the past, but of science fiction, the genre of the future. Here's a strong bit of evidence: Coincident to the attacks last week, Charlie Hebdo featured Michel Houellebecq, author of the new novel Soumission, on its cover. Set in 2022, Soumission is--as I understand it--not so much a dystopian novel as a satiric one about an Islamic takeover in France. Nonetheless, every dystopia must have a beginning. It's worth noting that in the book, the Islamists join forces with their socialist peers in parliament to form a government. Despite their differences, the Islamist and the socialist--both men of the future and both utopian and statist in their vision--would seem natural allies. That seems to be the case in our world today, not only in Europe but also here in the United States. Eric Hoffer noted a natural affinity among true believers, regardless of whether they call themselves Communists or Nazis. The difference here is that Islamists are men of action, fired by their belief in a holy cause. Contemporary socialists, on the other hand, are, at best, men of words only, having grown fat and complacent after so many years on the thrones of government and academia. There is little fire in them, least of all any holy fire. Socialists might think they can control Islamists. The man of words always believes there will be a special place for him when the revolution comes. More likely they would go down like White Russians or Mensheviks, for the belief with fire in it will always win out over the one without. (5) When I was young and watched Jonny Quest or James Bond, I wondered where Dr. Zin or Goldfinger or Blofeld found his henchmen, those hoards of anonymous men (often masked) who so willingly die for his cause. The answer became obvious as I grew older, for I realized that a man might kill or risk his life for money, power, or prestige, but he won't die for a cause unless he believes in it. In the real world, Auric Goldfinger would be out of luck, for he would not find men who would give up their lives for his cause, for his cause is his alone. If he wants men to give up their lives for a cause, it has to be a cause to which they can all subscribe, in other words, a holy cause, a mass movement. A few days ago I watched The Blair Witch Project for the first time. You might say I'm a little behind the times. After all, the movie was released in 1999. (Tempus fugit.) I remember the controversy surrounding it, and I remember something of the opinions for and against it. At this distance, I can say that I found it effectively creepy, though a little unfocused: the filming begins with recounted stories of at least three ghastly or supernatural events (four if you count the fisherman's own tale of having seen a ghostly mist arising from the water). The title itself seems to be a misdirection, for as it turns out, the ghost of a serial killer rather than the witch herself seems to be behind the disappearance of the three film students. Some viewers think that the serial killer was possessed by the Blair Witch, but there doesn't seem to be any indication of that in the movie. And as we all know, the story has to tell the whole story by itself. The Blair Witch Project hinges on the stupidity of its characters through a device called "the idiot plot." (I have written about idiot plots before.) The two men, Josh and Mike, are stupid for following the leader, a horrible creature named Heather. She is stupid because she doesn't realize how stupid she is. We have all known people who are insufferably confident in themselves (to the point of arrogance) and who drag people along with them, often to their doom. Imagine spending a week in the woods with a control freak: it could only have ended in murder. Anyway, I guess you could say The Blair Witch Project serves as confirmation of the Peter Principle, a principle that goes back through Laurence J. Peter and Raymond Hull to José Ortega y Gasset and states that people rise to their level of incompetence. More on Ortega y Gasset tomorrow. The Blair Witch Project should come with a warning: "Should not be viewed by foresters, especially not alone in a dark house at night." I work as a forester. I'm especially interested in movies that take place in the woods. (The Village falls into that category. I believe spicebush was the shrub with the red berries.) One of the things I noticed about The Blair Witch Project is that the woods in the movie look pretty thin and scrubby. Those aren't deep woods at all. I would say they are actually old-field woods, that is, woods that have grown up on the site of old farm fields, and consequently not far from human habitation. The location of the house in the woods seems to support that idea. I have come upon houses in the woods, though never one as large or as intact. I always explore them, wandering from room to room among the detritus and decay of former lives. I can say that every old, abandoned house is haunted, not with actual ghosts, but with the presence of the people who went before us and who lived their lives within these walls. The Blair Witch house is gone now. The State of Maryland, presumably people who work in natural resources, demolished it sometime after the filming. I have seen this kind of thing in natural resources people before. They will surely do it again. They would say that it's not in their mission to manage historical resources, or that the house was in a state of decay, or that it would have been too expensive to maintain or restore it, or that it would have been an attractive hazard, thus a liability. They may have their justifications. That doesn't excuse their lack of imagination. Of course maintaining a building in a state of decay is a contradiction in terms, but we should all remember that during the Gothic revival of the eighteenth and nineteenth centuries, people actually constructed new "ruins." Ruins and other old, decaying, remote, and abandoned places are after all the proper setting for the Gothic in our lives. As I have written, fantasy, especially weird fiction, seems to be about decay and about the past. It's interesting that the makers of The Blair Witch Project would take three contemporary people with modern equipment and place them in a premodern situation. How rapidly they revert. The cameras work, but the map is lost. And even though they have a compass, they wander in circles, as people who are lost tend to do. (I don't see any supernatural reason why they would have ended up at their starting point after having walked all day. That's what people often do when they are disoriented.) In the end, technology fails them. Being people of today, they are oriented towards the future. Instead, they are driven into the past, and there meet their end. The Blair Witch Project has its antecedents. It calls to mind those creepy documentaries from the 1970s about ancient astronauts, flying saucers, and Bigfoot. I'm also reminded of In Search Of . . . (1977-1982) and Kolchak: The Night Stalker (1974-1975). The reason I'm writing about it here is that the sticks in The Blair Witch Project remind me of the work of Weird Tales artist Lee Brown Coye and an incident in his life. His biography, Arts Unknown: The Life and Art of Lee Brown Coye by Luis Ortiz (2005), opens with an account of the artist's trip into the backwoods of central New York State in 1938. There, in a remote and abandoned place, he found stones arranged on the ground, bundles of sticks and boards nailed and wired together here and there, and an old house in which, fantastically, he was grabbed by a hand out of the dark. Once I became acquainted with Coye's work, I noticed the similarity between his bundles of sticks and those in The Blair Witch Project (even though I had never seen the movie). I wasn't the first to do so. Mr. Ortiz made note of it in his biography. So did Al Harron on the blog The Cimmerian. (You can read his entry of Oct. 13, 2009, here.) Both go back to a short story called "Sticks," written by Karl Edward Wagner and published in March 1974. "Sticks" is a fictionalized version of Lee Brown Coye's original encounter with the unknown in the cellar of an old house near DeRuyter, New York. Consciously or not, the makers of The Blair Witch Project were inspired by "Sticks" and Coye. Nic Pizzolatto, who scripted the TV show True Detective, acknowledged the influence of both in an interview posted on the blog The Arkham Digest, dated January 21, 2014, here. (Last year I wrote about True Detective and Robert W. Chambers in this space.) If Coye's story is true, then it only supports my proposition that real life is very often weirder than fiction. Anyway, like the characters in The Blair Witch Project, we are armed with the techniques and the technology with which we believe we will conquer the future. Instead, like them, we are ceaselessly borne into the primitive past. 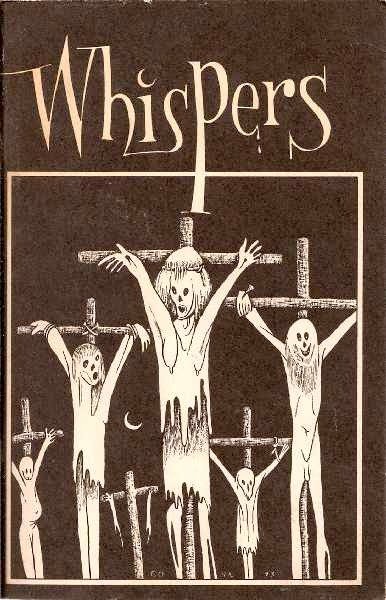 Lee Brown Coye's cover for Whispers #3 (Mar. 1974), in which Karl Edward Wagner's story "Sticks" first appeared. If you grew up any time from the 1940s to the 1970s, you probably remember reading Whitman Books. They were inexpensive hardbound books for children issued by Western Publishing Company of Racine, Wisconsin. The paper is not very much different from that used in pulp magazines. Even Whitman Books from the 1970s have tanned or yellowed with age. Many from the 1940s are brittle and on the verge of falling into pieces. The typical Whitman Book is one of a series starring characters from the comics, movies, or television. 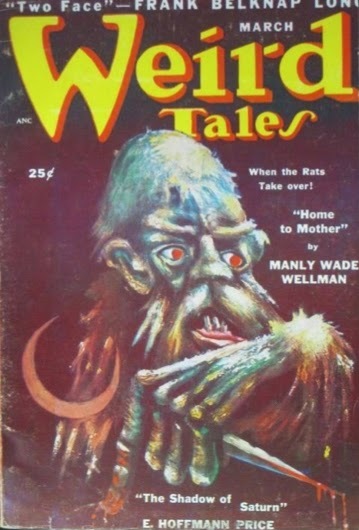 Fans of Weird Tales will like Ten Tales Calculated To Give You Shudders, from 1972. 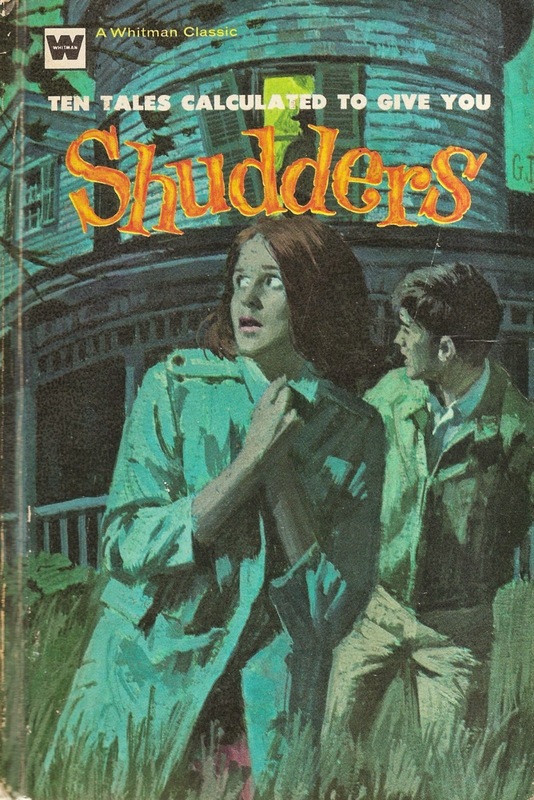 The cover art is by Gordon Johnson (1924-1989). Inside are ten stories selected by Ross R. Olney, with his introduction. 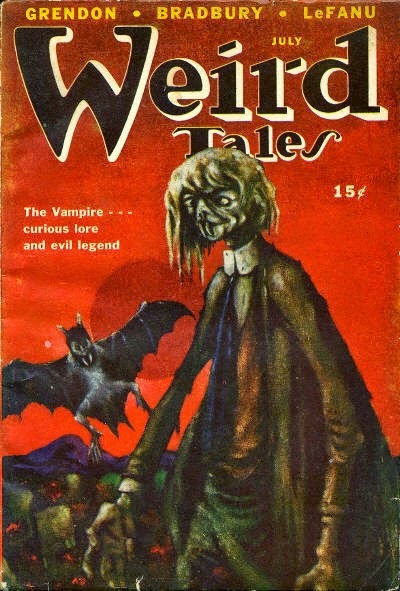 Four are from Weird Tales.